The show must go on, but it can’t without the namesake of the world renowned “Bronco Bob’s Wild West Extravaganza.” Bronco Bob may be gone, but no one is missing him. The unpopular owner of the biggest show in town was much better at pleasing his fans than his employees. Could one of his own cast members have decided it was time for Bronco to take his final bow? Maybe the diva in distress, Penelope Pureheart, wanted to see her name in lights? Or perhaps the hypnotic Professor Harry A. Pitts decided to make Bronco magically disappear? Surely the love-sick star of the show, Annie Oaktree, didn’t get trigger happy? Is it possible Smitty, the stagehand, stable hand, and understudy, is smarter than he seems? Hang on to your popcorn and peanuts, cause you’re in for a hilarious Wild West Show like you’ve never seen before! Marshal Jim Courtright – Jim is a kind lawman who likes to keep a peaceful town. He’s been waiting to see the famous Penelope Pureheart for years, but his excitement about the show will have to wait. 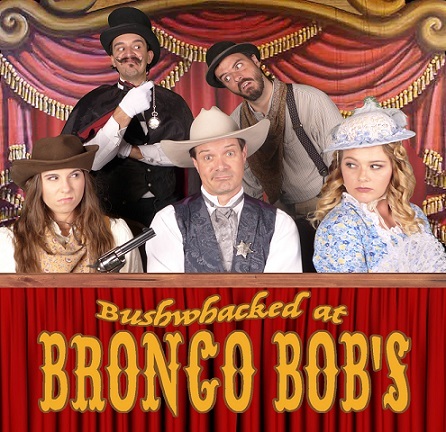 Bronco Bob is missing, and Jim will need to take over as director of this crazy cowboy conundrum. Smitty — Smitty is the bumbling stagehand in charge of everything from shoeing the horses to drawing Bronco’s bath to filling in as the understudy for all actors…and actresses…in the show. He’s the handyman who’s handy with everything except thinking. Annie Oaktree — Annie is the star of the Wild West Extravaganza. Why, she can out-shoot, out rope, and out drink any man in the west! Heck, she’s the best at everything…everything except lassoing her “Love Muffin’s” heart. Penelope Pureheart — Penelope is easy to tizzy and hard to please. Although she fancies herself the star actress of the show, this prima donna is much better at pouting than performing. She likes to be treated like a princess and has an affinity for French fries, French toast, and French men. Professor Harry A. Pitts — Pitts is the newest addition to the cast and his specialty is the power of suggestion. But don’t be disillusioned by this villainous magician or he might just put a spell on you. Mwahaha. Mwahaha.